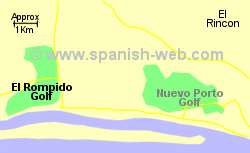 El Rompido golf course is situated on the Costa de la Luz, approximately 20 Km west of Huelva city. 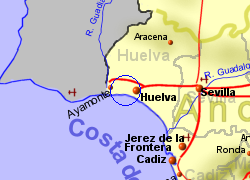 The courses (North and South courses) were designed by Alvaro Arana with total respect for the natural surrounding marshland environment and built in 2003 on flat land close to the Atlantic shoreline. The North course was the second of the two to be built (2006) and has longer and wider fairways than the South course. 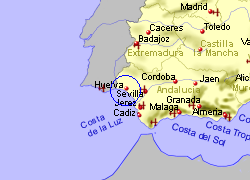 Facilities include a golf school, driving range, pitch and putt area, putting green, bar, restaurant, and 5 star hotel. The course has 2x18 holes. 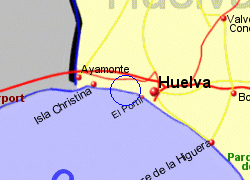 Map of the El Rompido area.